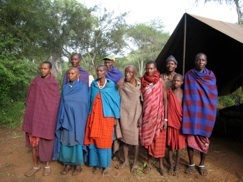 The above photo is of an African elder (in brown) surrounded by some members of his tribe. This photo was taken by Roberta Taylor two years ago when I joined a dozen Americans (and one from Brunei) to explore Tanzania. The trip was led by Richard Leider and David Peterson (Daudi). While I don’t remember this African elder’s name, exact age or very much about him, I do know that he was at least 75 years old, and loved by his tribal community. Over the past 5 years I have been helping the participants of the civic engagement/leadership development programs Leadership Twin Cities and Leadership Philadelphia answer this question: If today was your 75th birthday, and life had gone really well for you, what would people be thanking you for, especially those from your community? I tell each participant that one of the most important outcomes of their deep dive into community issues (one full day each month for 10 months) is to discover and pursue their community calling. I do this exercise each year for 60 Twin Cities and 110 Philadelphia for-profit and non-profit leaders because this 75th birthday vision can help shape today’s priorities. Let me walk you through it. Round 1 involves asking your three imagined 75th birthday guests what they would like to thank you for. These guests include one each from your personal, professional and community life, and don’t forget that the other person at the table is you! So what is each person thanking you for? Several years ago I heard a presentation by Larry Wilson, founder of the Twin Cities based training and organizational consulting company Wilson Learning. He told the audience that there is actually a mathematical formula for change readiness: Vision + Dissatisfaction + Process > Cost. In other words, our vision plus our dissatisfaction plus our process of change needs to be more powerful, more compelling, than the cost of change (most often this cost includes time, effort, risk, money, emotion). One only need look at how health clubs fill up in January and empty in May to see how costs can overpower the most popular new years resolution and source of dissatisfaction each year: losing weight and getting fit. How does this relate to community calling? My guess is that your imagined representative from the community at your 75th birthday party really wants to be able to thank you for your community contributions, and he or she probably thinks you are making progress today, but there is possibly something getting in the way (usually a cost) that you need to deal with. Can you fine tune and strengthen your vision (this 75th birthday vision will do)? Can you let your dissatisfaction with some community issue be amplified in your heart and mind to inspire you to action? Can you find a process that works for you over time, and overcome the cost factors? You now have some new tools, strategies and perspectives on discovering and pursuing your community calling and building a more sustainable community legacy. Try the exercises I have suggested. Picture yourself in the center of your tribe as a wise, generous and beloved elder. Happy New Year, and have a happy 75th birthday!